What better way to brighten up your humpday than with some gorgeous red lips?! I mean seriously, look at that before and after. Doesn't the red lipstick brighten up the face so much? I love how something so simple can have such a dramatic effect. I've put together a quick tutorial on how to apply the perfect red lip that will last absolutely all day. It is super easy and it really does work. After this tutorial, Ollie and I took a few photos, chilled at home and then went out for dinner and drinks. When I came home (about 8 hours after filming this tutorial), my lipstick looked as though I had just applied it. 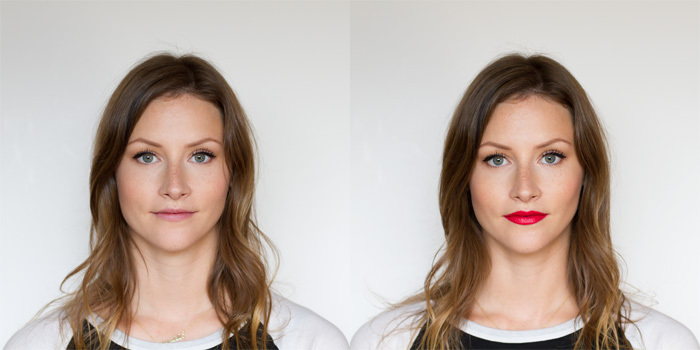 These same principles can be used for any lipstick color, but to me -- red is the true test. A fading red lip is not a pretty thing. Wow, great tutorial hun! I didn't know that you had to layer and blot, layer and blot. Plus the no-lipstick-on-the-teeth move, spot on! So great I found your blog for such great tips! I guess my besties like to keep their make-up secrets to themselves!